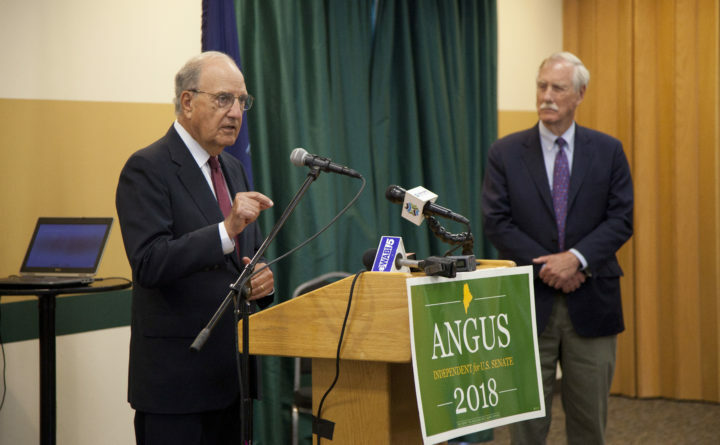 Former Senate Majority Leader George Mitchell speaks Friday at Husson University in Bangor alongside U.S. Sen. Angus King, an independent. Mitchell, along with William Cohen, a former congressman, U.S. senator and defense secretary, endorsed King in his bid for re-election. Former Senate Majority Leader George Mitchell and William Cohen, a former congressman, U.S. senator and defense secretary, expressed concern Friday about the rampant toxicity in today’s political landscape, fueled by partisan leaders more interested in sowing divisions than finding solutions. Mitchell, a Democrat, and Cohen, a Republican — both late 20th century Maine political luminaries noted for working across party lines — spoke Friday during a media event at Husson University in Bangor where they endorsed the re-election campaign of U.S. Sen. Angus King, an independent who caucuses with Senate Democrats. King, 74, served for two terms as Maine’s governor and was first elected to the Senate in 2012, after Republican Olympia Snowe chose not to seek re-election, citing in part the partisan gridlock in Congress. He has generally run a low-profile re-election campaign, formally announcing his candidacy in May. He is being challenged by Democrat Zak Ringelstein and Republican state Sen. Eric Brakey. A recent Suffolk University poll shows King well ahead of his major-party challengers, who continue to try to gain traction in an uphill race. Public opinion polls consistently rank King as one of Maine’s two most popular elected officials. King, who serves on the Senate Intelligence Committee, echoed points made by Mitchell and Cohen, saying the spread of false information, often promulgated by President Donald Trump on issues such as Russia’s interference in the 2016 election, continues to foster real ramifications. “There is no doubt whatsoever that the Russians interfered with our elections with the intent of disrupting our democratic process,” King said. Building a preemptive cyber strategy to avoid those attacks in the future is imperative, he said. But right now, there isn’t one. “We’re a cheap date,” he added. The first step toward security is acknowledging that outside interference happened, to separate fact from fiction, to differentiate between collusion in Trump’s campaign and general Russian interference, King said. “One of the problems with [Trump] not having made that speech and continuing to use terms like ‘witch hunt’ and ‘hoax’ is that it communicates to a significant part of our population that there really isn’t a problem,” he said. The solution to this national security issue, and why he feels compelled to continue his tenure in Congress, is “eloquent listening,” King said. “Common sense and judgment is what we’ve got to have, and that’s the standard I try to apply,” he said.